In prokaryotes, a ribosome binds to mRNA that is still being synthesized and initiates protein synthesis, and the mRNA is degraded with a half-life of a few minutes (see Selection 5 of Chapter 9, Fig. 9-8). 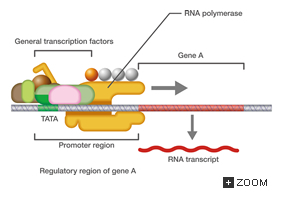 Determination of whether a gene is expressed to synthesize a protein is mainly based on whether mRNA is transcribed from it, or in other words, transcriptional regulation. In contrast, eukaryotic mRNA is first transcribed as pre-mRNA, which is a precursor mRNA. After this pre-mRNA is subjected to various processing procedures in the nucleus, it is transported to the cytoplasm through the nuclear pores. It is then finally used for protein synthesis (Fig. 10-3). 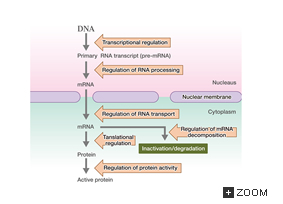 Transcriptional regulation of mRNA synthesis is also essential in eukaryotes (as discussed later in more detail), and the process between transcription and protein synthesis is also regulated. Regulation after transcription is called post-transcriptional regulation, and one of the characteristics of eukaryotic cells is that they are subjected to post-transcriptional regulation in addition to transcriptional regulation. With regard to post-transcriptional regulation, it is known that the stages of splicing, transportation from the nucleus to the cytoplasm, translation in the cytoplasm, and mRNA degradation in the same cell vary depending on the developmental stage of the cell. Post-transcriptional regulation exhibits specificity depending on the tissue and cell and changes in line with in vivo physiological conditions. Pre-mRNA molecules synthesized from the same gene have different destinies in different cells, which leads to the production of proteins with different amino acid sequences (see selection 2 of Chapter24, Fig. 24-2B). 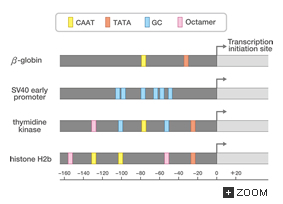 In addition to this fundamental system, transcriptional regulatory regions called enhancers and silencers change expression of various genes according to various changes in intra- and extracellular conditions (Fig. 10-5). These regions are cis elements with specific sequences, and some proteins (trans factors) recognized bind to them. When an enhancer-binding protein binds to the enhancer, binding of RNA polymerase to the promoter increases and a significant increase in gene expression is observed (Fig. 10-5). Conversely, silencers inhibit gene expression. 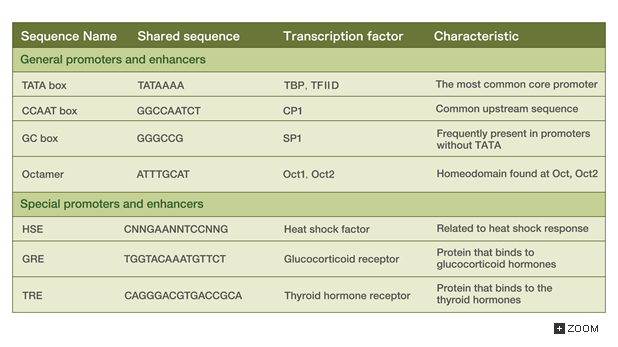 Enhancers and silencers are different from promoters in that they function even if they are located far upstream of the gene (sometimes tens of kilobase pairs away), and in some cases, if they are inside or downstream of the gene. In contrast, promoters never exist inside or downstream of the gene because they represent points where RNA polymerase binds, thereby initiating transcription. Another difference is that enhancers and silencers function in the same manner even when their sequences are reversed. With promoters, the binding direction of RNA polymerase is determined by the direction of the promoter sequence based on which the direction of enzyme movement and the selection of the template strand are determined. If the sequence is reversed, the enzyme proceeds in the opposite direction, preventing the promoter from functioning. In eukaryotes, it is common for single genes to contain multiple types of cis-elements (such as those described above) that regulate gene expression according to various intra- and extracellular signals. Accordingly, the regions regulating eukaryotic gene expression are exceptionally long, often exceeding 10 kilobase pairs. With regard to genes transcribed by RNA polymerase II (protein genes), representative cis-elements and transcription factors (trans-factors) that bind to them are shown in Column Table 10-1. 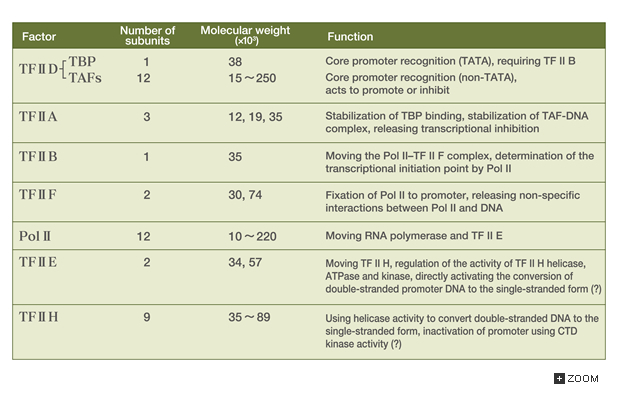 The main transcription factors are shown in Column Table 10-2. Usually, multiple cis-elements are present upstream of a single gene. These elements function with upstream enhancers and achieve regulation of complicated expression (Column Fig. 10-2). Eukaryotic DNA exists as a nucleosome structure in which DNA is tightly bound to basic proteins called histones (Fig. 10-6). The nucleosome forms a chromatin fiber when other proteins also bind to it. When histones and DNA are firmly bound together, RNA polymerase has a difficulty in binding DNA and synthesizing RNA. 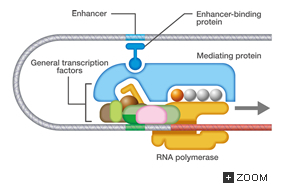 One role of enhancers is to loosen the binding between the histones and DNA and sometimes break the nucleosome structure in order to promote RNA synthesis by RNA polymerase. This phenomenon is called chromatin remodeling because it changes the nucleosome structure. 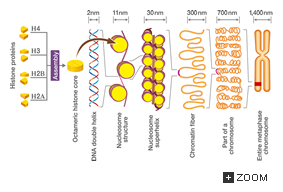 Regulation by chromatin remodeling is actually a complex reaction in which large numbers of different types of enzymes and proteins are involved. However, it can be schematically explained as follows. 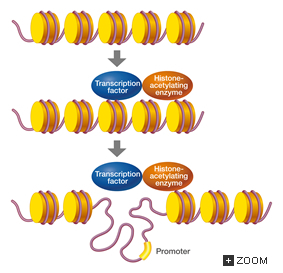 When a transcriptional activation protein binds to a specific enhancer, histone acetyltransferases also bind to them in order to acetylate the amino group of the histones. This lowers the basicity of the histones, weakens their connection with DNA, and promotes sequential dissociation of the histones and DNA from the binding site to the surrounding regions. As a result, the promoter is exposed and the RNA polymerase complex easily binds to it (Fig. 10-7). Conversely, if expression is to be suppressed, then histone deacetylases remove the acetyl group and restore the nucleosome structure.